Cathy Spivey Mendola is originally from Virginia but has lived in 6 other states and now proudly calls Clayton, NC her home. She has had a love affair with creativity since she picked up her first crayon. Life took a slight detour from creativity when she went to nursing school and pursued a career in nursing until she became a stay-­at-­home mom. 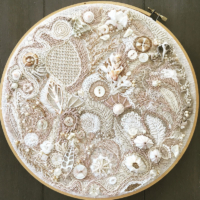 While raising her daughter she was able to carve out some time to experiment with many different art mediums, but she always comes back to her first loves­ fiber and jewelry. She has been sewing by hand since she was 8 yrs old and by machine since middle school. She didn’t get serious about making jewelry until the last few years but it has quickly become her obsession. 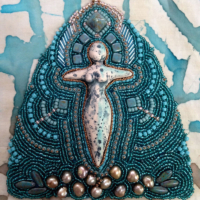 Cathy’s fiber art projects and jewelry have been exhibited in numerous locations in the Midwest. She had an art quilt that toured internationally with the Studio Art Quilt Association’s Exhibit, ‘This is a Quilt’. One of her art quilts was published in “1000 Quilt Inspirations” by Sandra Sider in 2015. 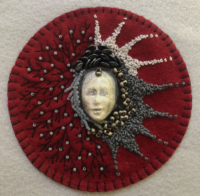 Her work with the fiber art group Women’s Journeys in Fiber has been published in numerous books­ “Footwear:Women’s Stories”, 2012; “Paradigm Shifts:Impressions of Change”, 2013; “Masks: Disguise­Expose­Celebrate”, 2014 and “Umbrellas: Open to Ideas”, 2015. Cathy’s jewelry was also published in the magazine ‘Belle Armoire Jewelry’ about the creation of her sea shell and fossil collection of necklaces. Cathy says her work seems to have come full circle over the past year as she has spent the majority of her time embroidering which was the very first thing she learned to do at her grandmother’s knee. She describes stitching slowly by hand as a sort of meditation with needle and thread. I am a mixed media/fiber artist. I have had a love affair with fiber since my first home economics class in the 8th grade and the passion to create with my hands goes back much further. I believe that incorporating fiber with other media creates endless possibilities. The simple act of playing in my studio to see ‘what if’ gives me the greatest satisfaction. I derive most of my inspiration from nature. I believe that organic matter in all it’s forms provides the most interesting textures & shapes. Beauty can be found everywhere in nature, even in imperfection. My early days of childhood were spent coloring inside the lines of my coloring books. These days, I am trying to teach myself to color ‘outside’ the lines and expand my skills as well as my perspective of fiber art.